Knit me into a cocoon. Help me eat a burrito. Pretend to be a chair at my dinner party. Wrestle a Komodo dragon. Race me in a lobster suit. Author Kelly Mahon posts absurd gig ads online and shares the conversations she had with the brave souls who wanted the job. We're living in a gig economy. But would you respond to an online ad seeking someone to search for escaped ants? Or take an offer for a free tattoo by someone who "needs the practice"? How about a mattress for sale "tainted by geriatric love" or a workout plan that involves throwing Virginia hams? And if you hit reply, and the poster is sketchy about the details or offers to pay you with a gift card for clams, how long would you keep the conversation going? When New York City copywriter Kelly Mahon started posting weird, fake gig ads as a creative outlet, she found that there was someone interested in every bizarre offer she came up with. The subsequent awkward email threads were equally hilarious and bizarre. 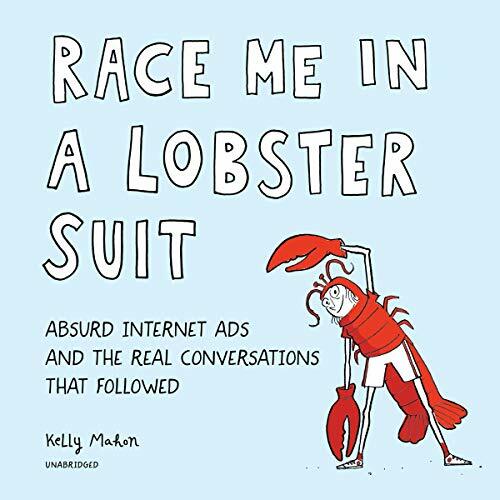 Race Me in a Lobster Suit collects Mahon's funniest fabrications, plus the hysterical email conversations that followed as she ratcheted up the crazy. While some respondents become suspicious, others seem willing to play along with the joke. And don't worry, everyone involved agreed to share their emails in the audiobook, so there are no hard feelings. In a world where it seems like everyone's suspicious of everyone else, it's nice to know there are still people who will at least consider helping a stranger reenact a recurring spider nightmare or explain the principles of pig Latin to a baffled mother of three. ©2019 Kelly Mahon (P)2019 Blackstone Audio, Inc. This is a weird one to rate. Some of these are legit hilarious. But I do see other's points about leading people on who really need jobs and kind of being a jerk. It's a bit of a mixed bag for me. Very weird. Just like the ads.